At any major tournament, there is bound to be hundreds of different stories waiting to be told. Each player has a respective journey that they have taken to get to a tournament. 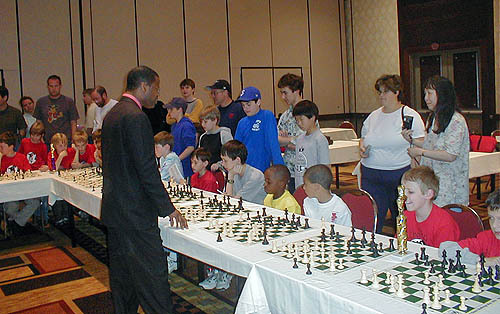 Leading up to the HB Global Chess Challenge, a number of stories circulated through the wire services about players who were headed to the HB tourney. Some of these had to do with elementary school players, young adults, older players, foreign nationals and locals. 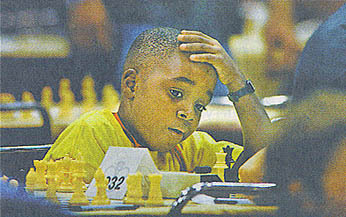 One such story comes from Trinidad and Tobago of a 6-year old player named Ronnie Nelson. 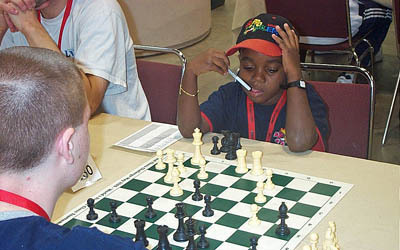 His trek from Port-of-Spain, Trinidad to Minneapolis, Minnesota was in pursuit of a challenge that he enjoys from chess. According to his aunt and chaperon, Lesley-ann Nelson, Ronnie picked up chess two years ago by attending chess lessons at Arima Boys' R.C. on Saturdays. After a few months, he got his first taste of victory and took 2nd place in junior tournament sponsored by First Citizens Bank. Last year, he played in his first tournament abroad in the Miami Junior Orange Bowl Scholastic Competition last December. As the youngest player in the tournament, he scored 2½-4½, but it was good enough for 3rd place in the under-9 section and he helped Trinidad take the overall team trophy. "Ronnie also cycles competitively. He recently received a medal for 1st place at the International Cycling competition held at the Arima Municipal Stadium in the 6 and under. He is also a gifted child, excelling in academics and has a high I.Q. compared to his peers. He can learn 50 words in five hours and presently knows all the Ministers of Government of his country which is 32. He can say his 2 to 12 times tables and loves reading his favourite educational software, Dr. Seuss. He loves going to the Movies and enjoys the game of cricket at the beach." Ronnie wishes to become a Grandmaster and got his first taste of the U.S. media making the May 22nd Minneapolis Star-Tribune (Metro/State section). 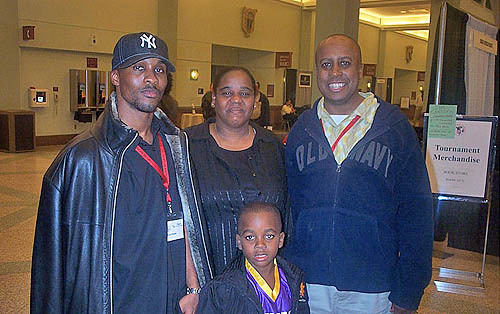 The Port-of-Spain resident scored 2-1 in the Scholastic Tournament during the HB Global Chess Challenge. Photo by Jim Gehrz. At the HB Global tournament, his proud aunt was seen always within eyesight of her nephew. Ronnie appeared to be quite overwhelmed with his Minneapolis experience and probably had never seen more the 1600 players in one location. 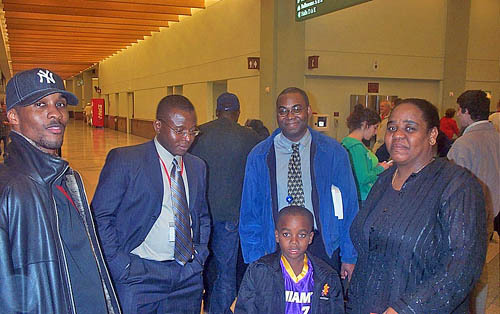 He did meet Harper and Trinidadian Terrence DePeaza (who lives in Atlanta) and a host of other players from around the world. Hopefully, Ronnie can draw from this experience and continue to improve his play. 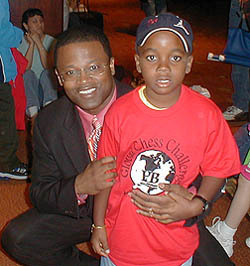 His family is seeking coaching services and are looking to attend a chess camp. Individuals or companies interested in sponsoring talented Ronnie can contact Lesley-ann Nelson at lescarmn32@yahoo.com or lescarm@tstt.co.tt. Dr. Sylvester Smarty and Dr. Okechukwu Iwu.